Anna Sui has just launched these tin houses to package her fragrances. How cute do they look? Looking at the packaging takes me back to my childhood! I always wanted a doll house, a large one...I guess it's never too late right? The tin houses contain a 50 ml bottle of one of her fragrances and are designed to be used as a jewellery box. I love the idea. I was recently sent Fairy Dance (*), and I'm glad I got this one as it smells gorgeous. 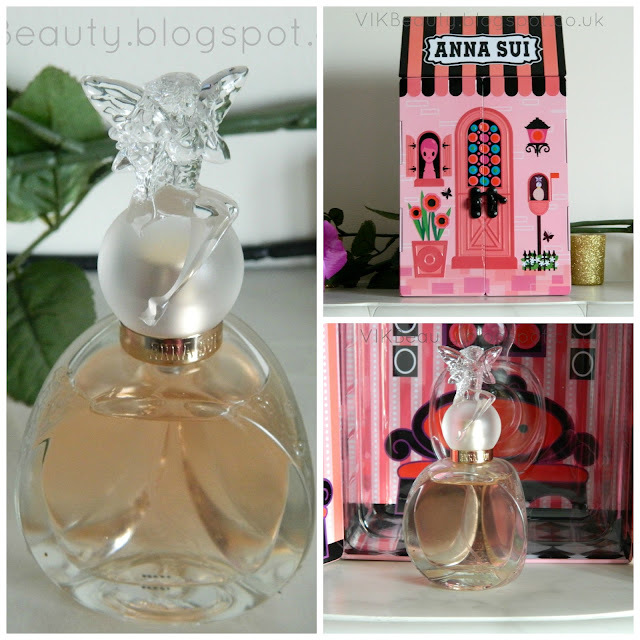 This is my first Anna Sui fragrance I have tried as I normally have my "go to" fragrances which I use. Fairy Dance is described as:" ..a shimmering, warm, seductive fragrance..". I agree, I thought it would be too floral & fruity (not really a fan of scents that are too fruity & floral), but it really isn't. It contains top notes of mango, tangerine and pink pepper with a hint of rose, peony and bamboo. The base notes contain sandalwood and vanilla. Now I'm not a perfumier, but with the combination of ingredients, you can imagine that it would smell nice. It really does. It's also not overpowering which is great. I think this fragrance is perfect for Spring/Summer as it is lightweight and fun. You don't really want anything too heavy when it's warm outside. This bottle is an EDT which doesn't last as long as an eau de parfum, but it does last for a couple of hours before you need to reapply it. I always carry my fragrance of the day in my handbag anyway so I can touch up if I have to. As mentioned earlier, the bottle is cute and girly. You've got a little fairy sitting on top of the lid. I think it just adds to the playful concept. These tin houses are availble now in Debenhams or other stores that stock Anna Sui fragrances. The tin houses retail at £36 for 50ml EDT. There are three fragrances in the range and they are worth trying out next time you're at a perfume counter. I do like this fragrance and will be trying out the others in the collection when this is finished. So there you have it, I've popped my Anna Sui cherry and I'm happy! Have you tried any fragrance from Anna Sui? I'm completely with you on that one - I always wanted a dolls house as a little girl. I'll definitely pop my Anna Sui cheery and try this next time I hit that perfume counter! This Anna Sui dolls house is so cute! !